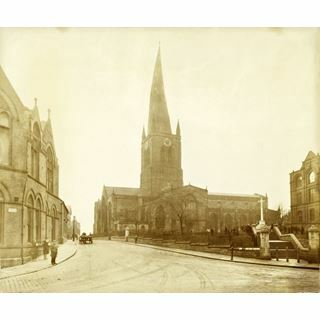 The Parish Church of St Mary and All Saints, Chesterfield is synonymous with the crooked spire on top of the church which partly gives Chesterfield its identity. Built c. 1325-50 along with much of the rest of the church in the 14th century, it was straight for several centuries before it began to twist, probably as a result of unseasoned timber being used for its construction. It now leans nearly 9ft to the south and is still moving. 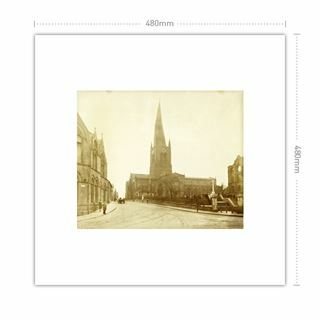 The tall spire is crooked due to the timber framework warping. (Although legend tells of a powerful magician who persuaded a Bolsover blacksmith to shoe the Devil. The blacksmith, however drove a nail into the Devil's foot. Howling with rage, the Devil took flight towards Chesterfield. Skimming over the Church, he lashed out in agony, caught the spire and twisted it out of shape. Local people have their own explanation that a virgin was getting married at the church,and the spire, never having seen a virgin bride before, leaned over to have a closer look. Should the event ever happen again, the spire will think it commonplace and straighten up.) 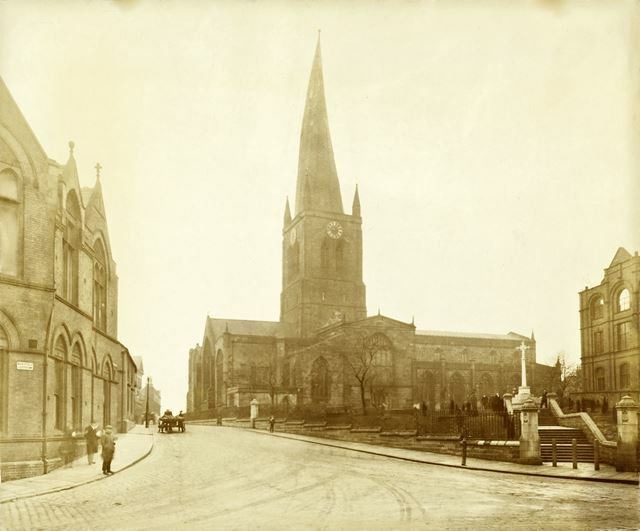 The large number of prosperous guilds in medieval Chesterfield accounts for the wealthy chapels attached to the church. 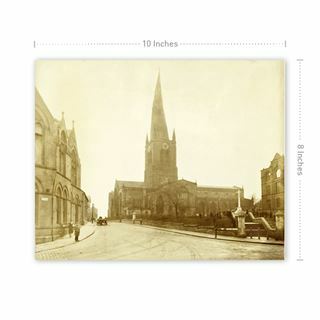 St Mary and All Saints is so often overshadowed by its spire that many people don't notice that its the largest church in Derbyshire. 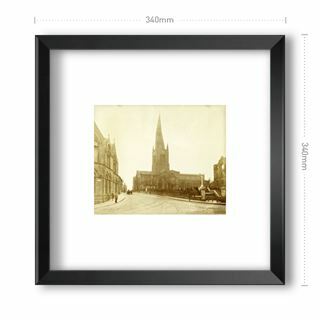 The large church is a fine cruciform building consisting of an aisled nave of 6 bays, a central tower, transepts and a 2 bay chancel, flanked by a chapel dedicated to St Katherine to the north and by a Lady chapel to the south. There are a further 2 chapels, one to the Holy Cross, the other to St Peter. The many chapels are due to the numerous guilds which once existed in the town, the oldest of which, the guild of Our Lady and the Holy Cross, was founded in 1218. The lady chapel contains a series of alabaster tombs of the Foljambe family. A particularly fine one is that of Sir Godfrey Foljambe and his wife.